Bird winter migration is here! Late fall and winter are perfect opportunities to go birding and see species not seen typically at other times during the year. Several species of birds are now migrating south to spend winter in warmer places. River Legacy sits right in the heart of the Central Flyway, which is one of the main bird migratory routes in North America. Some of the birds that can be seen this time of year include the cedar waxwing (Bombycilla cedrorum), white-throated sparrow (Zonotrichia albicollis), ruby-crowned kinglet (Regulus calendula), yellow-rumped warbler (Setophaga coronata), lesser scaup (Aythya affinis), northern shoveler (Anas clypeata), and hermit thrush (Catharus guttatus), among others. In addition to these birds, other common species such as the downy woodpecker (Picoides pubescens), northern cardinal (Cardinalis cardinalis), Carolina chickadee (Poecile carolinensis), and great blue heron (Ardea herodias) can be seen this time of year as well. River Legacy is the perfect place to check some winter species off your list. In fact, from December 14th to January 5th, thousands of people around the nation are engaging in bird counts for the annual Christmas Bird Count. 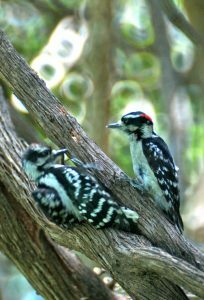 In addition, we encourage you to visit us February 17th for our Great Backyard Bird Count Festival. River Legacy is proud to participate in this global count, hosted by the Cornell Lab of Ornithology and the National Audubon Society. There will be bird counts, games, crafts, and activities celebrating the avian world. Lastly, make sure to keep up with the latest bird sightings at River Legacy by following our Birding Blog, which can be accessed through the link to the left of Nature Notes Blog on our website. Happy winter birding!